My friends scare me. Or to be more accurate, I’m scared for them. Of those who actually have jobs, not a single dollar of income goes toward saving for their eventual retirements — a day that will assuredly come whether they’re ready or not. Maybe it’s because our generation’s role models make blowing cash left and right so glamorous. I remember when Lil Wayne and Drake made headlines for dropping a stack of singles worth $250,000 on “entertainment.” I’ll admit that was pretty baller, but it’s no way to build a retirement fund. I understand how hard it is to part with a piece of your paycheck — a small one at that — knowing you won’t touch that money again for another 40 to 50 years. I opened my first retirement account when I was 19, but it took months of pushing and prodding from my supervisor to get me to do it. Even when I finally agreed, I was only allocating $20 per check to my IRA. Funny enough, though, I never really missed the money, and when I left my job I had a few thousand dollars already saved (partly thanks to my employer match). Even so, I still can’t understand why the gainfully employed 20-somethings in my life are acting like saving money for retirement isn’t important. The only idea that bothers me more than slightly lower take-home pay every month is the thought of working every day for the rest of my life because I can’t afford not to. Now that’s scary. There’s mixed opinion over whether Generation Y, born between 1983 and 1994, is good or poor at saving money. My take is that Gen Y is really behind on saving for retirement, and it’s not for a lack of opportunity. However, many believe that the timing of the Great Recession will motivate Gen Y to save more out of fear of what happened to their parents’ retirement funds, many of whom are baby boomers. A 2012 survey conducted by Scottrade found that only 63 percent of Gen Yers are currently taking advantage of a tax-deferred account — the smallest percentage of any generation. Even worse, only 37 percent of Gen Y participated in a retirement savings plan offered by an employer in 2011. That’s why I can’t wrap my mind around the fact that the same survey found that 74 percent of respondents in the Generation Y age bracket report a strong level of confidence in their ability to plan their own retirements. I suppose that’s us in a nutshell — secure in our own skin and completely fearless, even if that confidence is totally unfounded. Unfortunately, in this case, that attitude is hurting our chances of ever retiring. Related: How Old Are You Really Based on Your Savings Habits? Christine Fahlund, vice president of T. Rowe Price investment services, told Reuters that members of Generation Y needs to save 15 to 20 percent of their annual incomes — starting at age 25 — in order to maintain their same standards of living in retirement. That sounded insane, even to me, until I used a retirement calculator to discover I’m pacing $2.6 million behind my total projected retirement needs. Time to up that contribution. The bright side (if you want to call it that) is the economy is still doing poorly, which means investments are cheap, often undervalued and easier to buy. Plus, we young ones are a lot better off than older generations — while workers in their 40s, 50s and even 60s are desperately trying to recoup the retirement savings they lost during the financial crisis, we have the next several decades to ride out market ups and downs. We have time on our side, the key ingredient to a whole lot of return on investment so long as we save. Don’t believe it? 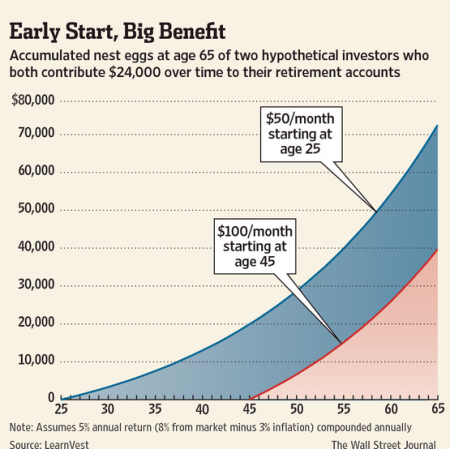 The Wall Street Journal reported that “a 25-year-old who starts saving just $600 a year could have $72,000 at age 65, nearly twice as much as someone who saves $1,200 a year beginning at 45,” according to calculations by LearnVest.com. Start small: A lot of numbers get thrown around regarding how much young workers should be putting aside for their retirements, but ignore them if the idea of saving 20 percent of your income stresses you out and prevents you from opening an account. Instead, just contribute what you feel you reasonably can. You can always up contributions later. Take advantage of employer matches: Remember that most companies don’t make you tackle your retirement savings alone. Be sure you’re receiving an employer match — usually a percentage of salary, or a percentage of contributions — so you can take advantage of free money and grow your savings that much faster. Automate: Have your retirement contributions automatically withdrawn from your pay and deposited in your 401(k), IRA or other tax-deferred account. You won’t have to think about money you can’t spend. It might be difficult to start saving for a goal that’s 50 years away, but remember that the longer you wait, the harder it will be to catch up. Doing something is better than doing nothing, so open a retirement account today — even if you can only contribute a little bit to start. Nicki Minaj Vs. Rihanna: Which Top AMA Nominee Is Likely to Go Broke First? Do I Need a Home Appraiser?